Your Windows user profile is a collection of settings on your PC that contain system preferences and files. Learn how to fix it when it breaks.–PC Pitstop. 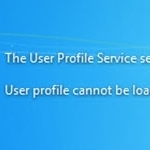 If you get the error The User Profile Service failed the logon User profile cannot be loaded when you attempt to login, you can try to perform a repair of the profile. If you are able to login to an administrator’s account, switch to that account. If the damaged account is the administrator account, try rebooting and enter safe mode by tapping F8. Try and login to the account in safe mode. PCTechBytes windows user profile. permalink.